In September 1982, Johnson & Johnson considered eliminating one of its flagship brands - Tylenol. Someone in the Chicago area had been replacing the acetaminophen in their extra-strength capsules with cyanide. Before it was over, seven people were killed and Johnson & Johnson faced a crisis of public confidence in their products few companies ever experience. This is the situation in which David Meyers found himself during his first job after graduating from the Lazaridis BBA program in 1981. “I didn’t know it at the time, but this would be the first of many moral and ethical issues I’d face over my career,” says Meyers who was selected to be the first CEO-in-Residence of 2019 at the Lazaridis School. He framed his talk about crisis management and business ethics around three key experiences from his career. Instead of ending the Tylenol brand all together, Johnson & Johnson decided to pull all of its product off the shelves at a cost of more than $260 million in today’s dollars. The company also decided to lead the industry in anti-tampering product design. From there, Meyers moved into the food industry to a company that was more concerned with profits than ethics. One day, Meyers’ boss came to him and asked him to offload hundreds of thousands of dollars in marketing expenses to the next budget year. These lessons in integrity would continue to serve Meyers as he advanced his career, eventually landing at the position of Managing Director of Mount Gay Distilleries Ltd. in Barbados. Meyers did everything a manager should do to reduce losses, including tightening thousands of barrels to re-calibrating all of their machinery and tools. But in the end, the only explanation for losses this high was theft from inside the production facility. Using a private investigator, Meyers eventually uncovered two theft rings involving 17 employees who were running a very sophisticated operation to steal and sell strong rum on the black market. Today, Meyers is the President and CEO of Canadian Iceberg Vodka Corp., the largest Canadian-owned vodka distillery in the world. The lessons Meyers has learned over the years have helped him gain perspective into the opportunities that lie behind a crisis. In order to respond, you must first understand the issue. Don’t try to solve a problem you don’t understand. Once you understand it, manage the crisis – quickly. Stop the immediate harm first – safety is always the most important thing. Know who to trust and keep them in your inner circle. Communicate properly as the situation requires. Act decisively once a decision has been made. Seek feedback, fine-tune your strategy, repeat. 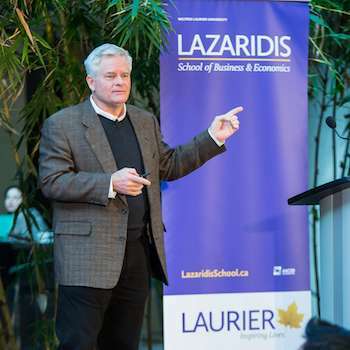 The Lazaridis CEO-in-Residence Speaker Series is hosted twice a year by the Lazaridis School of Business and Economics. For more information about how to get involved, contact Patrycja Godomski.